It is Open House on Sepia Saturday over Christmas and New Year : Sepia Season rather than Sepia Saturday. Just post your posts whenever you have the time and add your link to the Linky List. 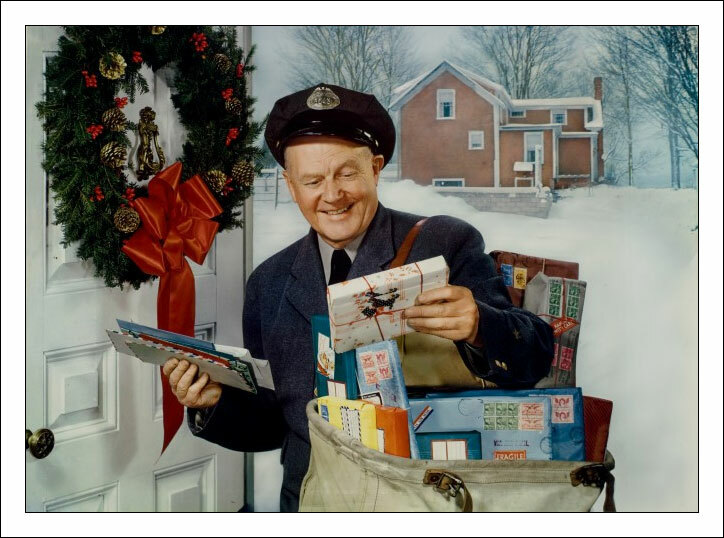 Post as many seasonal offerings as you want and keep calling back to check on what everyone else is posting. If you want a theme you can dissect the above 1945 image by the American photographer Nickolas Muray which is brought to you courtesy of the George Eastman House Collection on Flickr Commons. The more normal Sepia Saturday (Sepia Saturday 107) will return on Saturday January 7th 2012. In the meantime may I take this opportunity to wish all my many Sepia Saturday friends throughout the world a wonderfully enjoyable Christmas and a peaceful and prosperous New Year. The Festive Season is almost upon us and I thought I might give you something of a festive prompt - and this is quite some feast!. 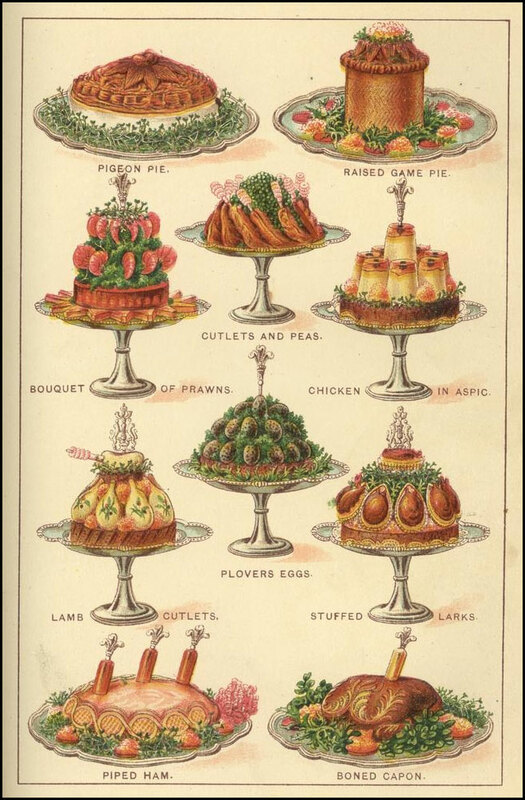 It is an illustration from the 1901 Edition of Mrs Beeton's Cookery Book (courtesy of the State Library of Queensland’s collection, courtesy of Flickr Commons). As you can see, the food on offer includes a raised game pie; pigeon pie; lamb cutlets; piped ham and boned capon. So you have a veritable cornucopia of visual prompts which should have you posting up with the stuffed larks. For Sepia Saturday 105 post your posts on or around Saturday 17th December. The Saturday after that will be Christmas Eve and the one after that, New Years' Eve. I have therefore decided to make Sepia Saturday 106 an open seasonal call which will cover both Christmas and New Year (I will put the call post up early next week). The normal Sepia Saturday fare will return with Sepia Saturday 107 on the 7th January 2012. But all that is in the future : for now just tuck in to SS105, Bon appetit! I won't be here for Sepia Saturday 104 (post your posts on or around Saturday 10 December 2011), but by now everyone knows how it works, so all you need me to do is to set some kind of theme for those who are theme-minded. 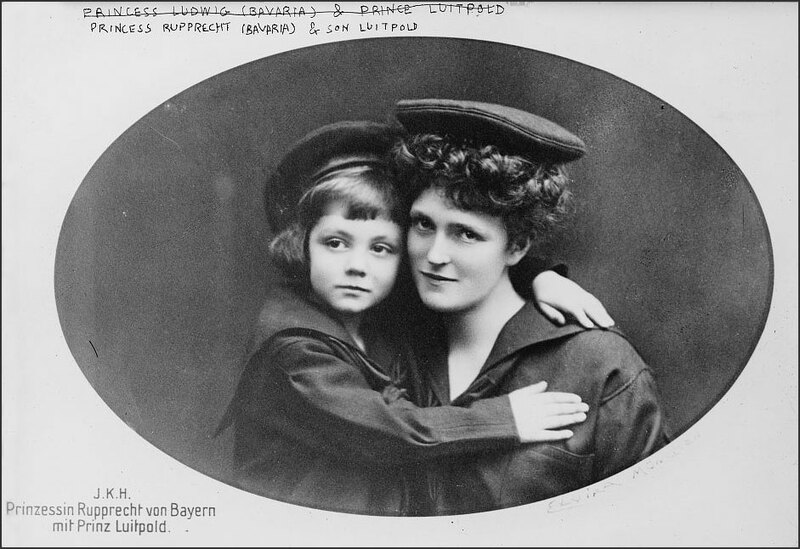 And seeing as I will be spending a few days in Bavaria, what better choice for my archive picture this week than this delightful study of Princess Marie-Gabrielle of Bavaria and her young son Prince Luitpold. 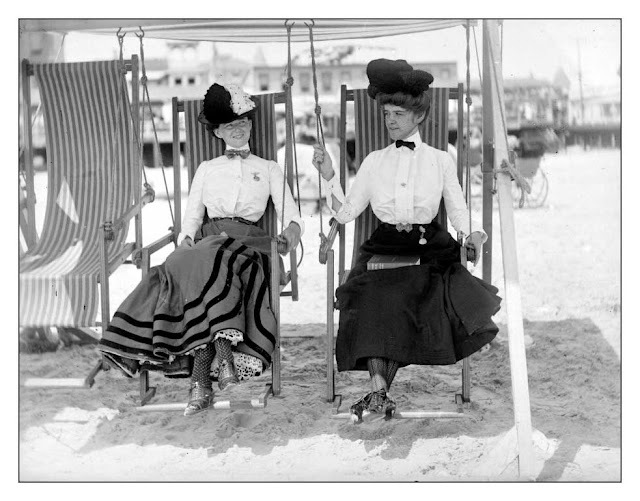 The photograph comes from the Bain Collection of the Library of Congress and they suggest a date for the photograph of between 1910 and 1915. The latter end of this timescale is obviously wrong for the Princess died of renal failure in 1912 whilst the young Prince died in 1914 of polio. He was born in 1901 and he looks about five or six in this photograph which would date it as 1906/07. Marie-Gabrielle's husband and Luitpold's father was Crown Prince Rupprecht of Bavaria who survived the downfall of the Bavarian monarchy and two world wars, and died in 1955 aged 89. You can take whatever theme you want from the photograph or you can ignore themes all together : just enjoy yourself. While you do that I will no doubt be enjoying myself investigating the Christmas Markets (and the bierkellers) of Munich. I am going for my winter flu jab tomorrow, visiting the nurse at the local health centre. This is in Brighouse, West Yorkshire and not Richmond, Virginia and I will be visiting the nurse rather than her driving out to visit me. But the similarities were enough to make me choose this 1961 photograph from the Adolph B. Rice Studio (part of the Library of Virginia collection on Flickr Commons) for my archive theme picture for Sepia Saturday 103 (post your posts on or around Saturday 3 December 2011). Of course, you don't have to follow the theme - whatever that might be - you can go where you want to. Just stay healthy and enjoy your Sepia Saturday. "Honest weights, square dealings" : that's Sepia Saturday. The Old Reliable weekly Blog provides a perfect pointer to those who want to link their old images to new memories. So when you are fishing around, trying to think of what to post for Sepia Saturday 102 (on or around Saturday 26th November 2011), take a look at this week's prompt photograph : there is so much going on here that it can give rise to the most complex flights of fancy. 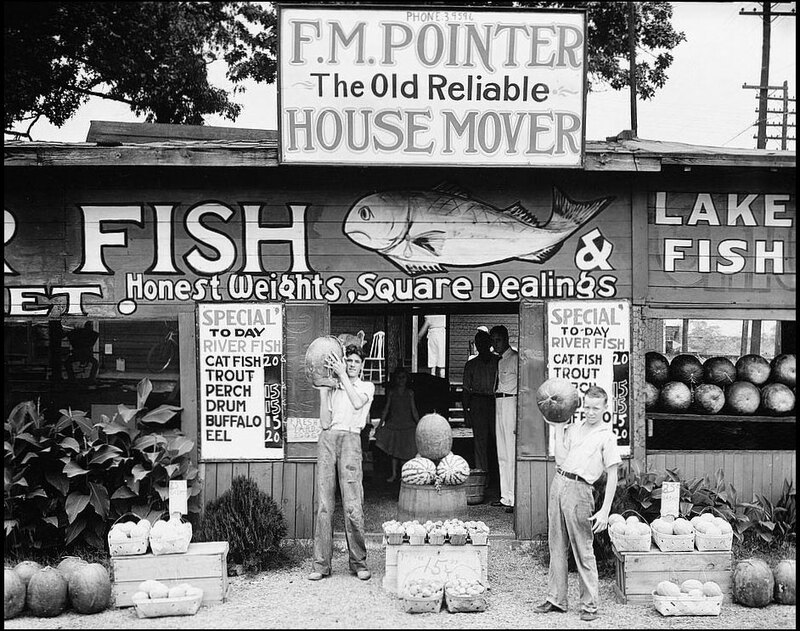 It is a 1936 photograph (brought to you courtesy of the Library of Congress) by that great American photographer Walker Evans and it is called "Roadside Stand Near Birmingham, Alabama". You can use this as a theme or you can post off-theme : the choice is yours. Just post, link and then take a look at some of your fellow sepia posters. First of all a big thank you to everyone who took part in Sepia Saturday 100 : it was the biggest and the best so far and the host of brilliant contributions made it a memorable occasion. It was a fine weekend of celebration and I have decided to leave the party in style in "the greatest Chevrolet in Chevrolet history". 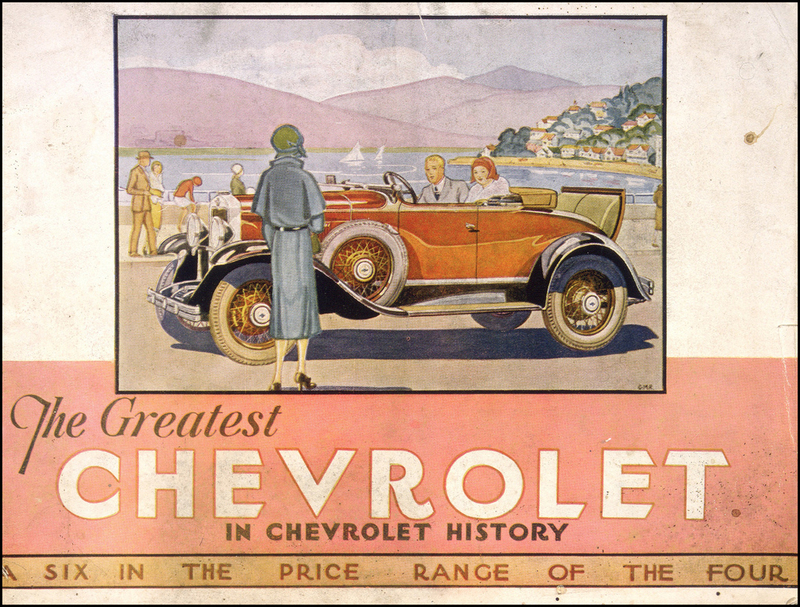 My illustration this week comes from the collection of the National Library of New Zealand and it shows the front cover of a 1930 Chevrolet sales catalogue. If you are wanting a theme for Sepia Saturday 101 (post your post on or around Saturday 19th November 2011) there are themes a-plenty in the illustration. It doesn't matter if you don't want to follow a theme : all we need from participants is an interesting old image and a few new memories. If themers want to give their readers a representation of the original theme image I am including a smaller version which you can include in your post if you would like to. So, here I go, jumping into my smart new car ("a six in the price range of the four") and speeding off to my next century of Sepia Saturday calls. SEPIA SATURDAY is a weekly meme which encourages bloggers to publish and share old images and photographs. All that is required is for contributors to post an old image (it doesn't have to be in sepia) and provide a few words in explanation. If you could provide a link back to the Sepia Saturday Blog and visit as many of the other contributors as you can, it would also be appreciated. Each week the call for contributions incorporates an old archive image and many people like to use this as a theme for their weekly posts. You will need to use your imaginations to identify you own theme from the provided image, and you can always choose to abandon any theme and just post an image that is special to you. Once you have published your Sepia Saturday post, add a link to that post to the Linky List published each week and leave a comment to let everyone know you are joining in. We are now well on our way to our Sepia Saturday 100 celebrations and as the bus passes through Måholmen in Sweden it stops to pick up the band. 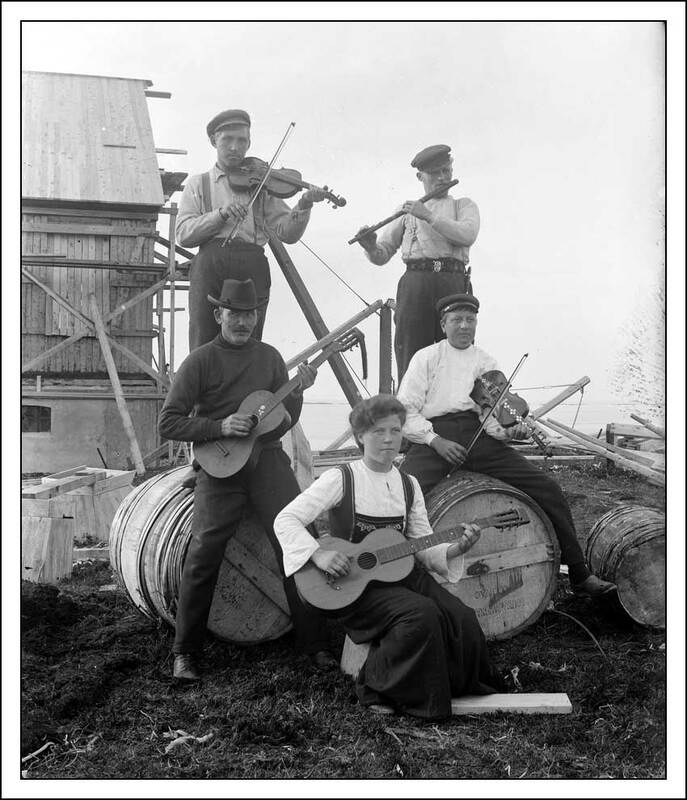 We are lucky enough to have secured the services of the Lighthouse Workers' Band - the above photograph was taken by Anders Folkestadås in the first decade of the twentieth century - who will be playing for our entertainment at the Centenary Party. But before that comes along (Saturday 12 November), we have Sepia Saturday 99 to celebrate (on or around the 5th November 2011). For the themers among us there is a wealth of possibilities in the above image (which comes from the Flickr photostream of the County Archives in Sogn og Fjordane) so strike up the band and get your posts ready. It is time to jump on the bus : but where is the bus heading for? Well the final destination is the celebrations that will mark Sepia Saturday 100 which will be taking place on or around Saturday 12th November. In order to give everyone due notice for this momentous occasion I can now announce the theme for SS100 and it will be, of course, 100. 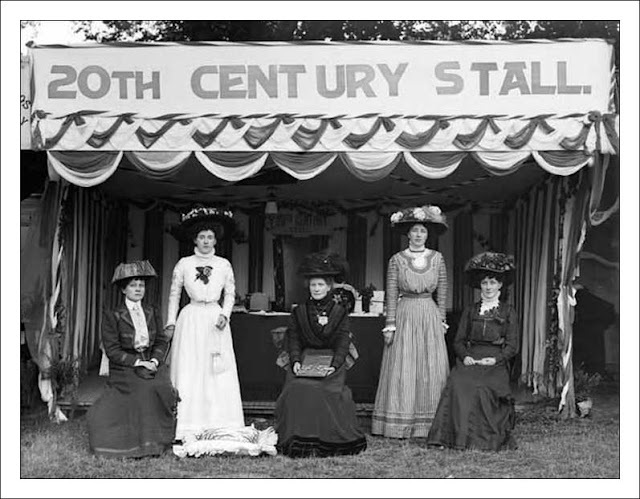 As usual, you can interpret that in any way you like : photographs from 100 years ago, centenary photographs or, if you wish, you can republish your favourite Sepia Saturday post from the first 100. You have plenty of time to think about it, so save your centenary posts for the middle of November. For now, we have just got on the bus, so for Sepia Saturday 98 (on or around Saturday 29th October 2011) you can search the above image for potential themes. 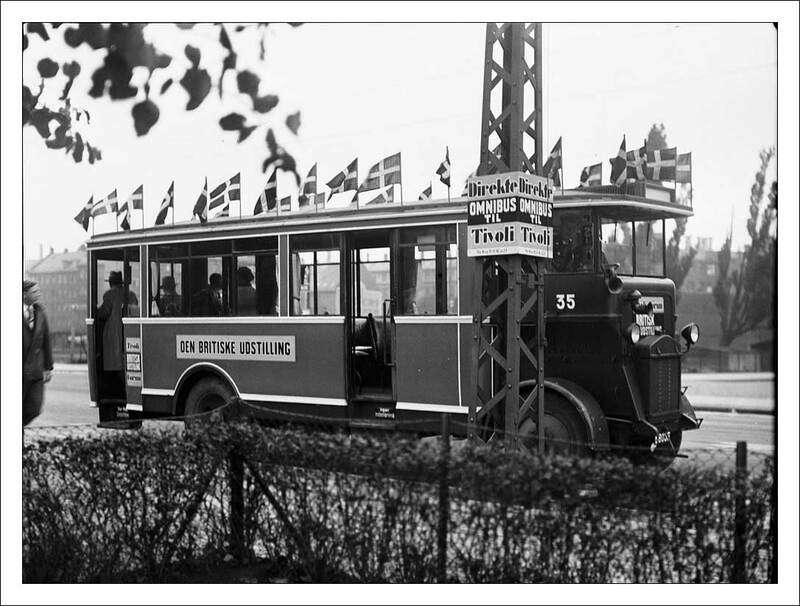 The image comes from the Photographic Archives of the Stockholm Transport Museum and has been made available by the ever-wonderful Flickr Commons. All aboard please, ding, ding. "Look Up" said the photographer and at least two of the boys (yes, it appears they are boys) did exactly that. 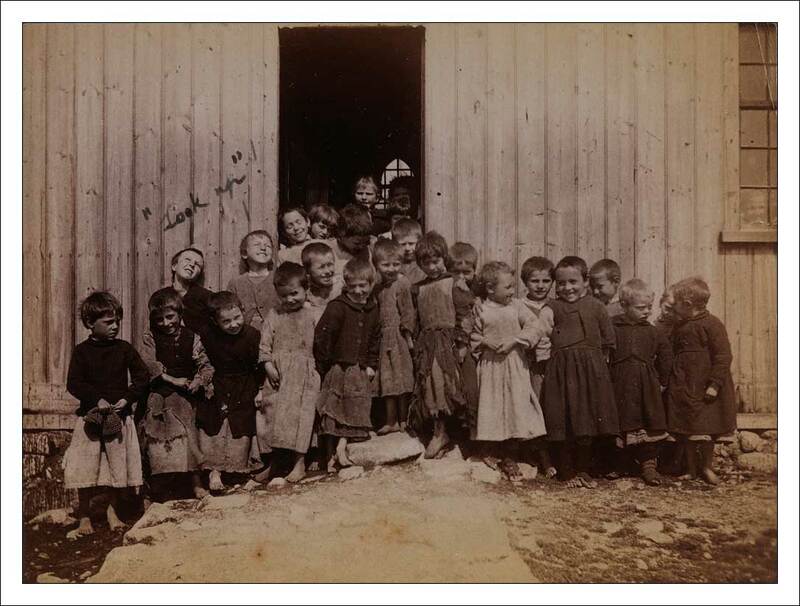 The photograph was taken outside a school in Connemara in Ireland by a certain Major Ruttledge-Fair in the 1890s and it now forms part of the collection of the National Library of Ireland. As well as being a charming image, it provides a multitude of potential prompts for the "themers" among our ranks (you really don't need me to identify them). Whatever the theme - or indeed the lack of theme - just publish your post on or around Saturday 22nd October 2011 and add your name to the linky list below. The rest of us will look up your contributions with interests. I don't normally do requests : but reading Christine H's comment on last weeks' post, how could I resist. "I have a bust week, so I'm not participating this time, but hope to be back next week, especially if the theme is kidneys, World War II, cooks, or strange outfits", she wrote. 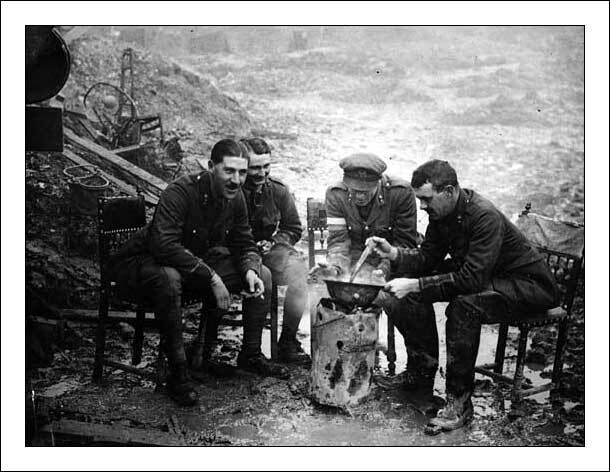 Well, there may be kidneys cooking in that tin hat although I accept that it is the wrong war : but it is the best I can do. So for most themers they can take their choice from war, cooking, chairs, or fires. For non-themers they can post whatever old image they want. And from Christine we expect nothing less than a perfect match. All you need do is cook up your post and serve it on or about Saturday 16th October 2011. Bon appetit! 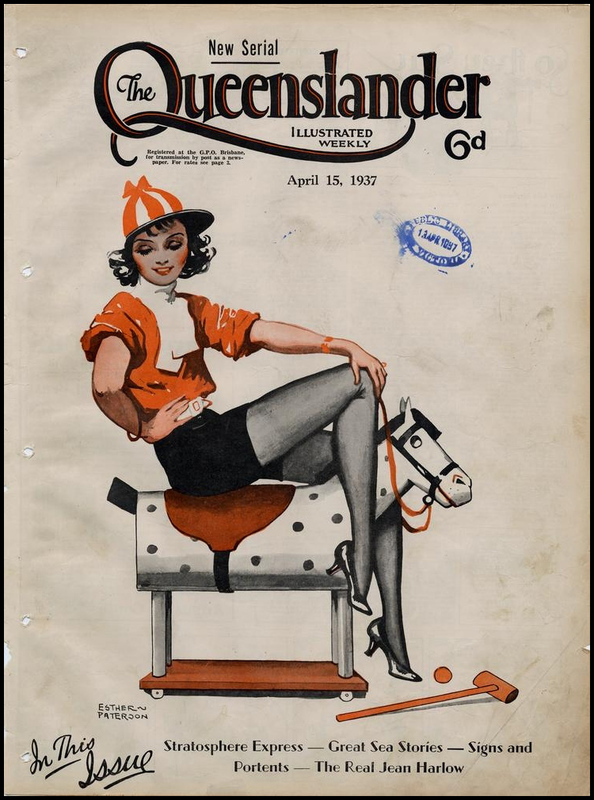 A very different picture of women for my theme photograph this week following the Queensland pin-up girl of Sepia Saturday 94. This archive photograph is taken from the Flickr Commons collection of the Royal Library of Denmark. 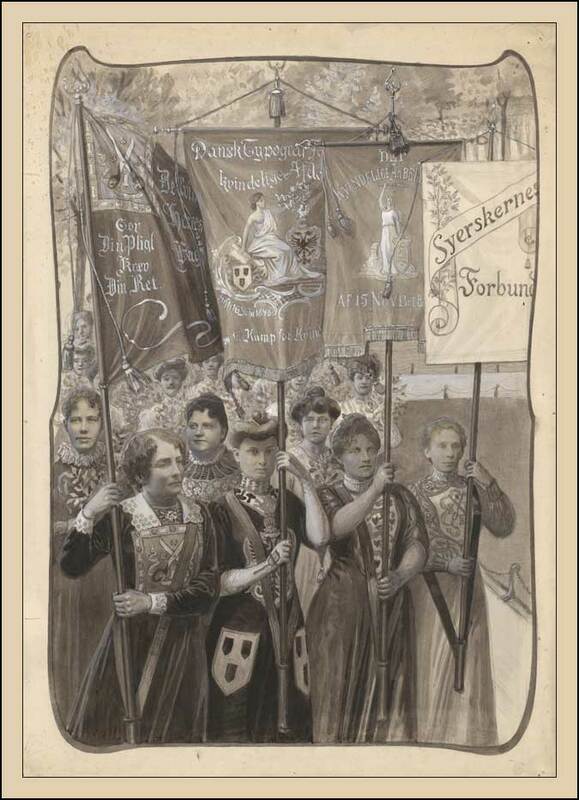 The photograph is by Henriette Crone (1874-1933) and shows Danish women marching for social justice and its inclusion in the Flickr set "Women in Parliament" is timely given the fact that Helle Thorning-Schmidt became the first female Prime minister of Denmark earlier this week. You don't need me to suggest themes based on this photograph - just post whatever interpretation you come up with on or around Saturday the 8th October. As always, you don't need to follow a theme - as long as it is old and interesting that is all we are concerned with. And speaking of old and interesting - I am sure people have noticed that the Sepia Saturday count is nearing 100! If anyone has any suggestions as to how we should celebrate our centenary please let us know in your comments. 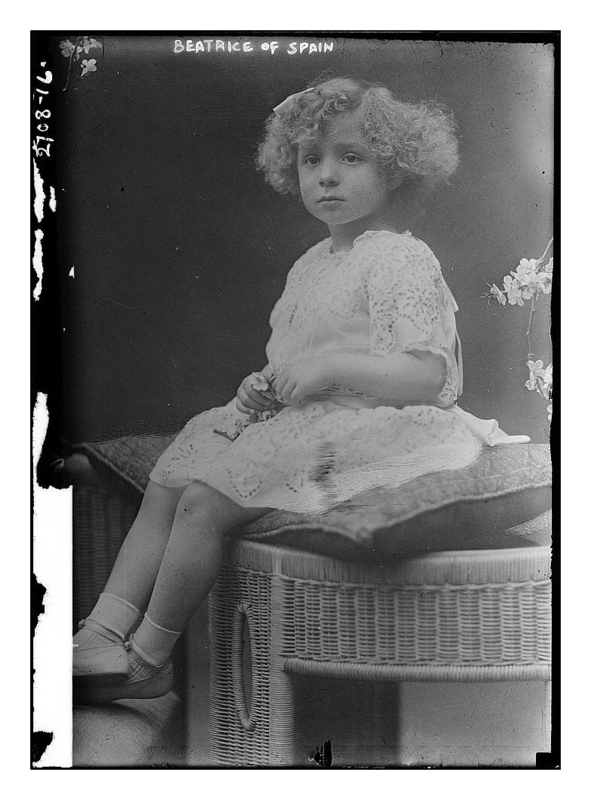 The picture above dates from 1916 and shows the Infanta Beatriz of Spain (1909-2002), daughter of King Alfonso XIII of Spain and Victoria Eugenie of Battenberg. The glass negative forms part of the George Grantham Bain Collection at the Library of Congress and has been made available to the world via the Flickr Commons initiative. For once, I have to confess, it is not a random choice : it results from a Flickr Commons search for "Spain". The reason for this is that, by the time Sepia Saturday 90 comes around, I will be soaking up the sun in Spain. For those seeking a theme this week they might want to choose little girls, Spain, holidays or ... whatever. As always your ability to follow a theme doesn't really matter, what is important is to use an old image to say something interesting. Post your images on or around Saturday the 3rd September and link them to the list below. If I can manage to get a decent wifi signal I will follow all your contributions whilst sipping a cold beer and applying another layer of suntan lotion. Hola! The title of this image, which comes from the Flickr collection of the State Library of New South Wales, is "Depression Bread Wars, Corner Shop on Bourke and Fitzroy Streets, Surry Hills, Sydney, 21 August 1934. The photograph was taken by Sam Hood and what I love about it is the mass of information it contains. It is one of those photographs you can almost read like a book : moving from highlight to highlight piecing together a plot, a story, or in this case something of a tragedy. It is also one of those images that gives wide scope to the Sepia Saturday Themers :it is almost impossible to find whatever theme you want within the mass of prompts contained here. So, once again, I invite you to choose an old image and tell a story. The story can be as short as a sentence or as long as a lifetime, it can be fact or fiction, happy or sad. Your choice. Our reading pleasure. Just post it on your blog on or around Saturday 27th August 2011 and link to it using the Linky List below. "I think that I shall never see, A poem as lovely as a tree". This splendid photograph of a tree was taken in 1910 by Huron H Smith and forms part of the digital collection of the Field Museum in Chicago which has been made available via the Flickr Commons Project. 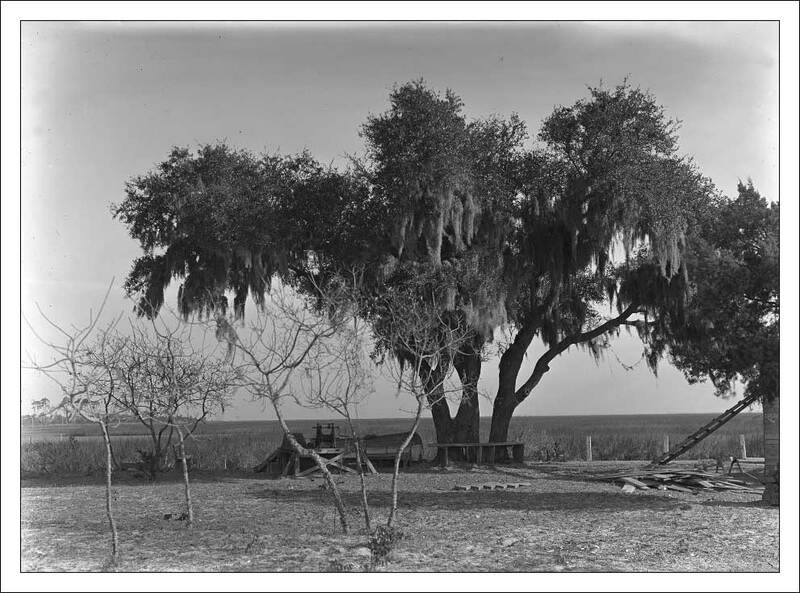 The title given to this glass negative by the photographer was "A Poet's Tree" as it pictures the actual oak tree in Glynn County, Georgia, under which the poet Sidney Lanier wrote the poem "The Marshes of Glynn". For people who like a theme for their Sepia Saturday contributions, a tree would seem a suitable starting point. Whatever you post, post it on or around Saturday 20th August 2011. I am looking forward to seeing the various contributions because: "I think I will probably see, a post as lovely as a tree". My dip into the archives this week brings us a bit of a change. After weeks' of marble-cold statues, cold chrome bumper bars and robotic looking space suits, it's time for a little romance. And romance - or the Danish "Romantik" - is the title of this photograph by Sven Turck which comes from the collection of the Royal Library of Denmark (available via the ever-splendid Flickr Commons initiative). There is no date given, but I would guess the 1940s or early 1950s (Turck died in 1954). If you are looking for a theme for this weeks' Sepia Saturday (on or around Saturday 13th August 2011), you don't need my guidance, you can work it out for yourself. Love to all. I have no idea what is going on in this photograph, but I am reliably informed that it was taken at the World's Columbian Exposition which was held in Chicago in 1893. I chose it because I was walking by a field the other day and I was reminded, yet again, what a mighty fine beast a cow is. 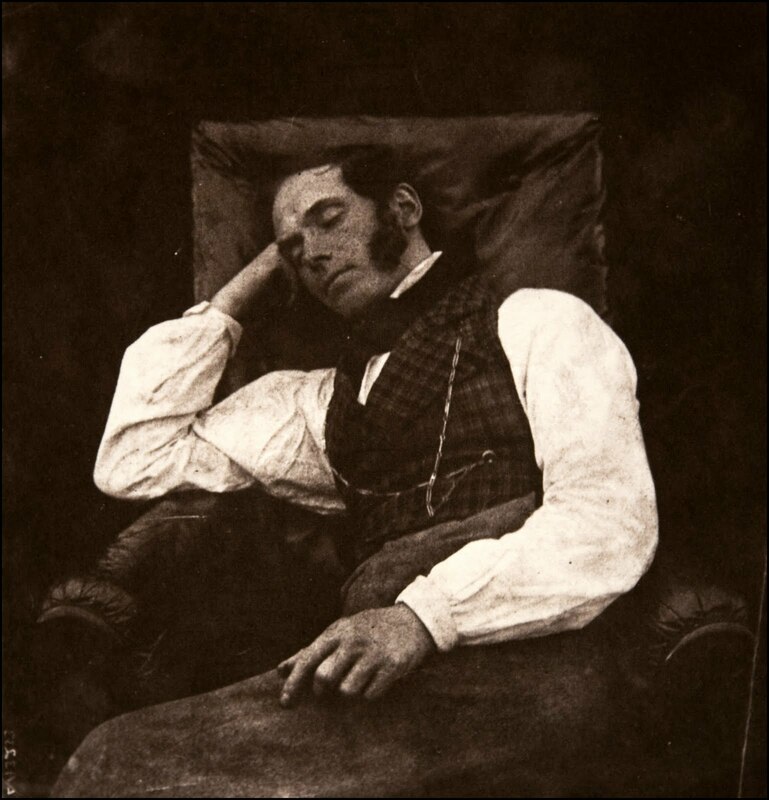 I was determined to look for a suitable Sepia Saturday archive picture - and here it is. So, themers, take your pick : cows, statues, exhibitions, boating lakes, lamp-posts : the subject range is as wide as your imaginations. Sepia Saturday 86 will take place on or around Saturday 6th August 2011. 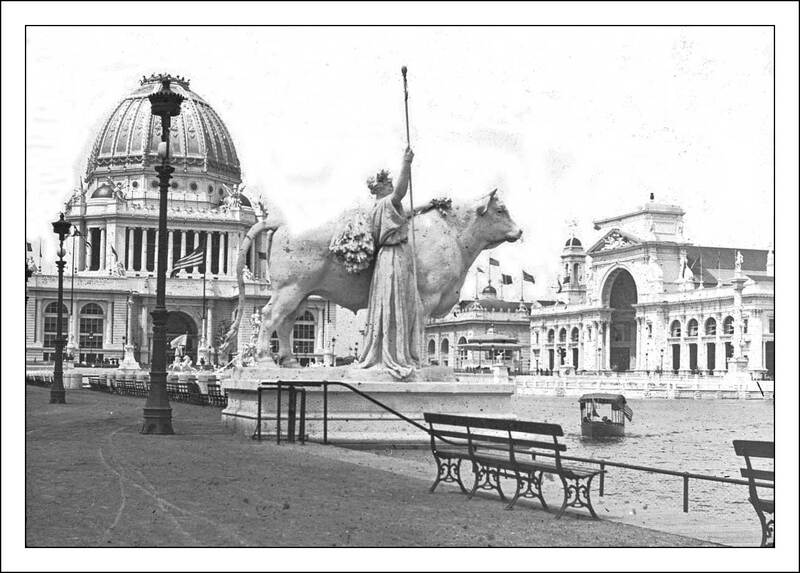 Don't stand still like a statue - get moo-ving and get your submission lamp-posted. 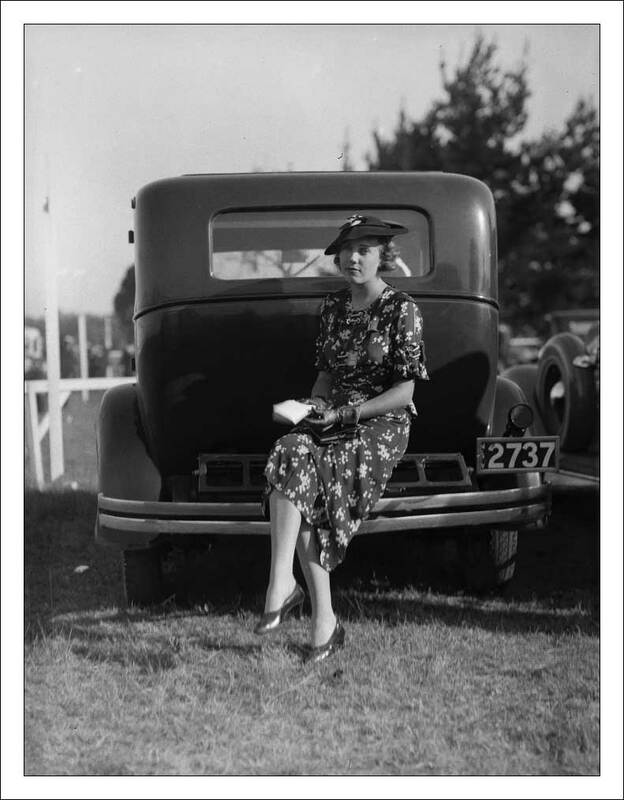 A random dip into the on-line photographic archives brought up this rather nice picture entitled "Woman Sitting On Bumper Bar of Car At Warwick Farm Racecourse". 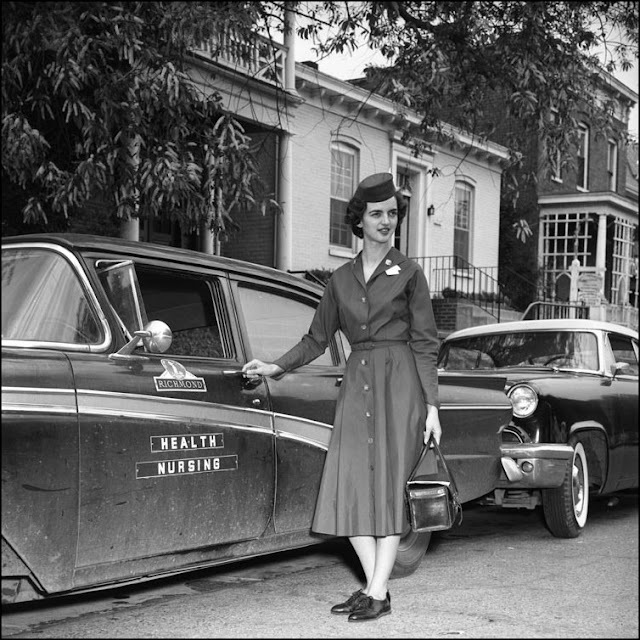 Ah for the days when cars had proper bumpers : if you tried that today you would soon have grass on the back of your dress. It would appear that the picture was taken in 1934, probably by Tom Lennon, and comes from the digital collection of the Powerhouse Museum in Sidney. Sepia Saturday 85 will take place on or around Saturday 30th July 2011. Everybody is welcome - let's hope we have a bumper bundle. This particular archive photograph celebrates two events : the last flight of the Space Shuttle and the fact that NASA has just added some 350 archive photographs to the Flickr Commons initiative. My chosen photograph dates back to 1964 and shows a researcher testing out an early space suit for the Apollo Moon Project. I recognise that this image may pose a bit of a challenge to the "themers" among Sepia Saturday followers, but I have every confidence in their ability to find images that fit whichever theme they care to identify. Whether you are following a theme or not : you can get into orbit with Sepia Saturday 84 by posting your post on or around Saturday 23 July 2011. 10, 9, 8, 7, 6, 5, 4, 3, 2, 1, Lift-off. "What's going on? 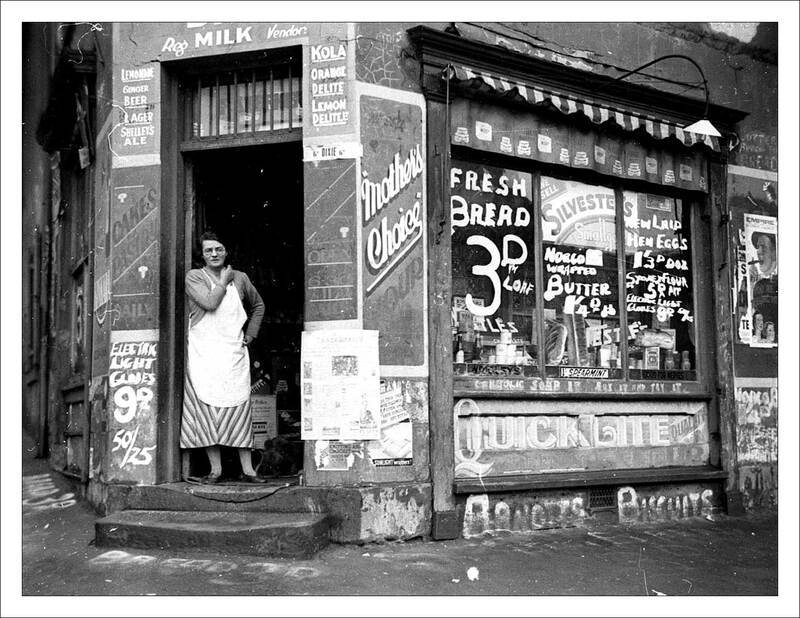 ", you may ask as you look at the Sepia Saturday Blog and see some changes in the side-bar. The changes are long-overdue as I realised that the list of contributors had not been updated since Kat set the blog up a year and a half ago. So I have got rid of the old list and replaced it with a new list based on those or took part in last weeks' Sepia Saturday. I have probably missed some people out and therefore if you are a Sepia Saturday participant and want your blog entering on the Sepia Saturday Participants" blog-roll, just let me know. "What's going on? ", you may ask as you look at my archive picture for this week. It has the imaginative title "Three Men Playing Cards In An Alcove" and it is by an unknown photographer and taken on an unknown date. It comes from the excellent collection of the Powerhouse Museum in Sydney and has been shared with the world via the ever-wonderful Flickr Commons initiative. 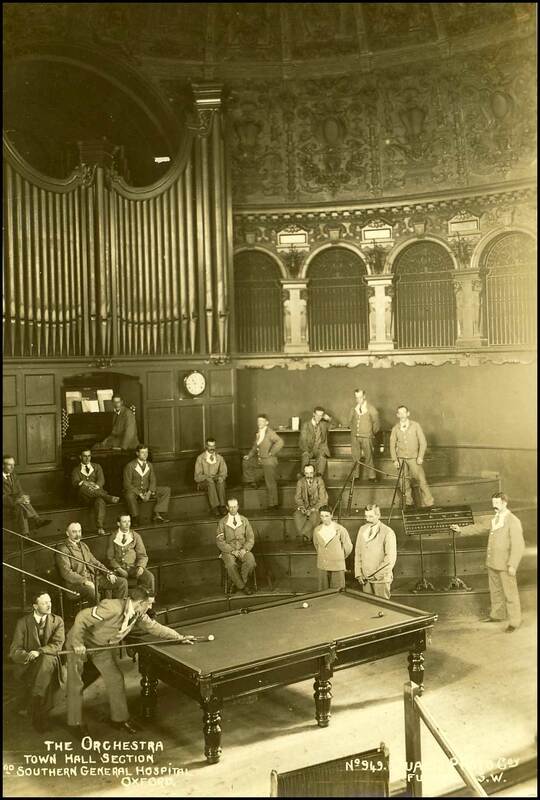 There are all sorts of questions you can ask about this particular image, to what extent is it posed, how old is it really (the Museum suggest that it dates from the 1890s) and, most importantly of all, what is the four of clubs doing half hidden on the chair? "What's going on?". The answer is simple : Sepia Saturday 83 is going on - on or around Saturday the 16th July 2011. Why not come and join us? Bring your own bottle of beer. My choice for this weeks' archive image was not guided by any hidden agenda, merely by the fact that it is a fabulous photograph. 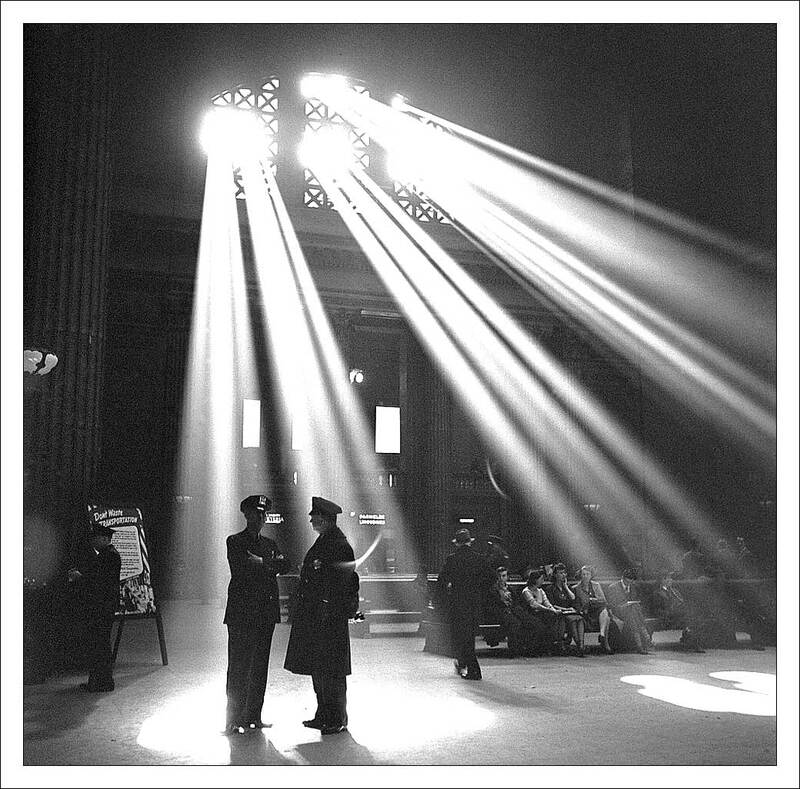 It would be a fabulous photograph if it was taken now, it was a fabulous photograph in 1943 when it was taken in Union Station, Chicago by Jack Delano. 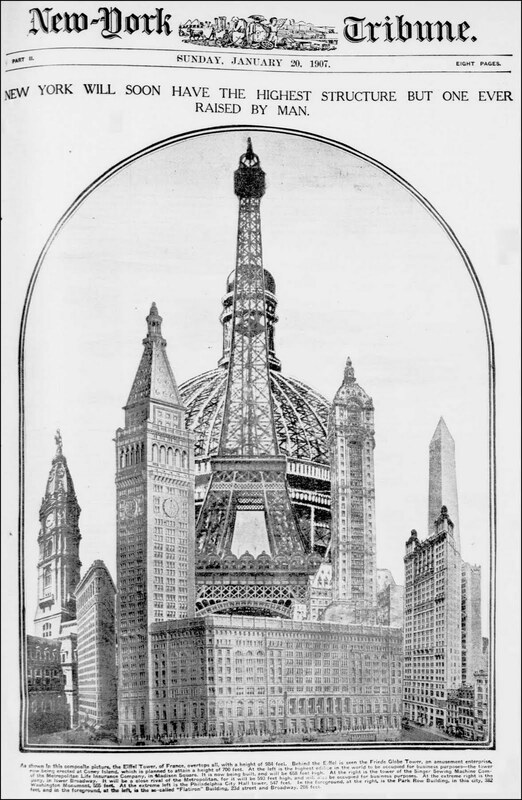 It is part of the collection of the Library of Congress which is available on Flickr Commons. As usual, themers can take from it what they will. For both themers and memers, Sepia Saturday 82 will take place on or around Saturday 9th July 2011. Hurry along to platform 2. Well I am back - just about. The routine of my life seems difficult to uncover among the changes brought about by holidays, retirements and all the rest. A little patient excavating is needed : brushing away the layers of dust and sand that time has deposited, but hopefully I will be back blogging, commenting and generally making a nuisance of myself within the next few days. In the meantime here is a Sepia Saturday call for you all and the archive image comes from the collection of the National Library of Ireland. Little is known of the image other than it was taken in 1909 at a bazaar in Tramore, County Waterford. What appeals to me so much about the photograph is that - with the benefit of a century-worth of hindsight - the ladies look so nineteenth century rather than twentieth century. What would they of thought of the century and the radical changes they were trying to portray? So if you want a theme for the coming Sepia Saturday you could always try photographs taken in the twentieth century - how about that for scope! Sepia Saturday 81 will take place on or around Saturday 2 July 2011. I look forward to catching up with everyone then. Although I am posting this before I leave for holiday, by the time Sepia Saturday 80 gets around (on or about Saturday 25th June 2011) I should be back. And I will be participating. And there is a reason why I have chosen this particular image : but you will have to wait until my post is up to find out. 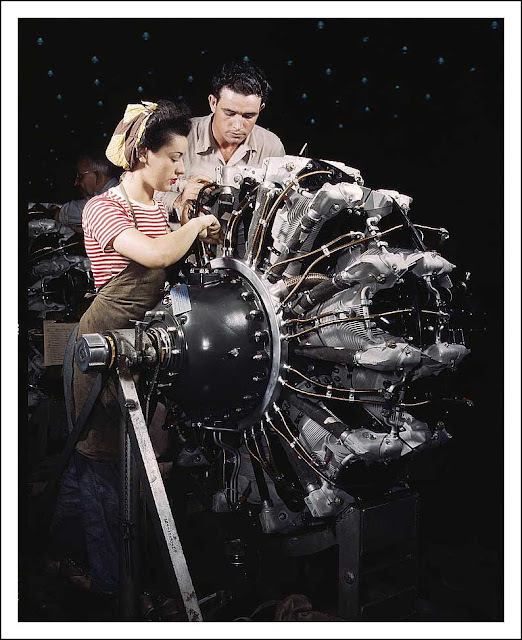 The photograph above dates back to 1942 and it comes from the collection of the Library of Congress. If you want to follow a theme, feel free - but pick whatever theme you like from the above image. Whatever you choose, come and join me for Sepia Saturday 80. I am still away : and when you get to see this call I should be somewhere in the middle of the Atlantic Ocean. I had a quick look to see if I could find any archive photographs of the Atlantic and then realised that the ocean looks like the ocean : wherever it may be and whenever it was captured on film. The best I could come up with is this photograph taken in 1905 on Atlantic City Beach, Hopefully, by the time Sepia Saturday 79 comes around (on or about Saturday 18th June 2011) the sun will be shining wherever you may be. But remember, too much time in the sun is not good for you, so step inside for a few moments and add a post to Sepia Saturday. Sun or sand, beach or ocean blue - or something completely unrelated. It matters not as long as it is old. By the time you read this, I won't be here. No, this is not a message from beyond the grave, it is just that I am pre-posting this in the hope that it will magically appear once I have left for my holidays. If all goes well. by the time this appears I will be in America, and by the time Sepia Saturday 78 comes around (on or around Saturday 11 June 2011) I will be about to enter New York Harbour on a hunking-big cruise ship. So my archive photograph this week features New York - although the "themers" out there might want to hang their coats on a number of hooks including newspapers, office buildings, or even the Eiffel Tower. Whatever you post, post it and link below. 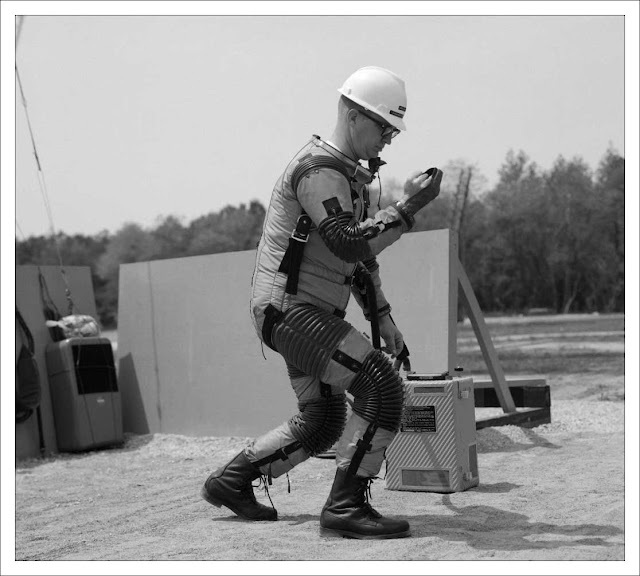 Just remember, I will be searching for a cyber-cafe in New York so that I can keep up with all your submissions. Sepia Saturday 77 will take place on or around Saturday 4th June 2011. 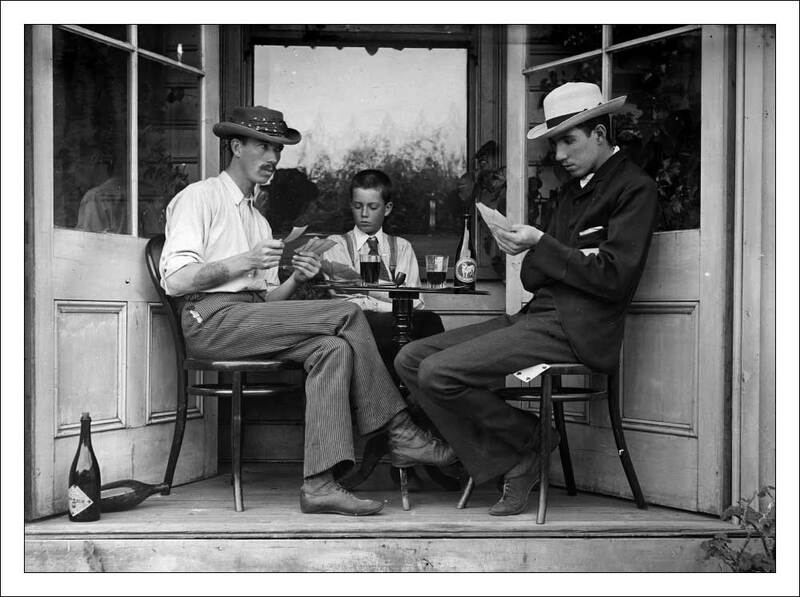 A couple of days later we will be off on our holidays and therefore the next few Sepia Saturday Calls have been prepared beforehand and pre-posted. Blogger still seems to be a little off-colour and sickly and therefore if things go pear-shaped whilst I am away, just keep posting your sepia posts and linking where you can. I will be back in time to launch the call for Sepia Saturday 81 which I will put up early in the week starting Monday 27th June. 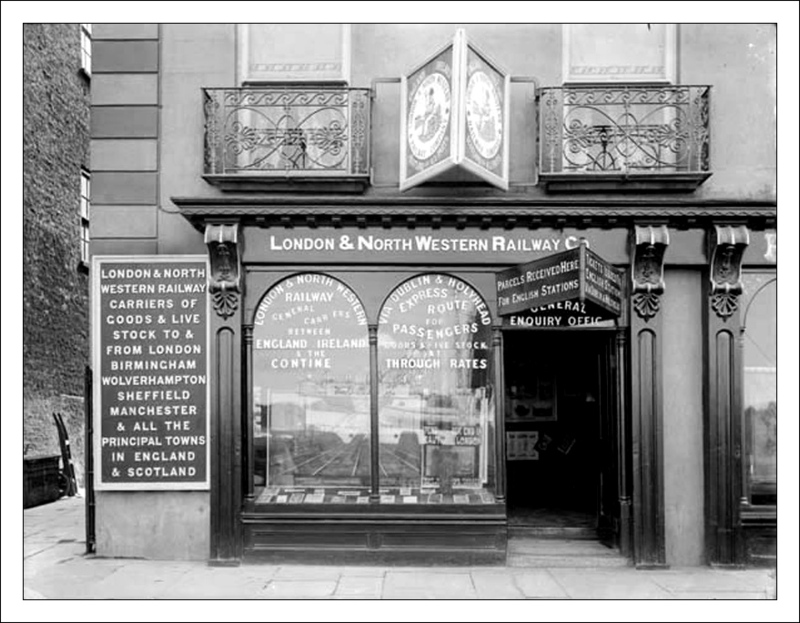 My holiday will start with a train journey down to London, so I thought an archive image of a railway train might be appropriate. This particular image comes from the Library of Congress archives and is taken from a glass negative from the Bain Collection. The Library of Congress had little information about either the engine or the date the photograph was taken, but in the very best spirit of the Internet within a few weeks of it being displayed on their Flickr Collection, information had come flooding in from enthusiasts. It appears that it is "1395 Archimedes, a Webb Dreadnought class divided drive compound (note the large cylinder-head cover above the buffer beam). 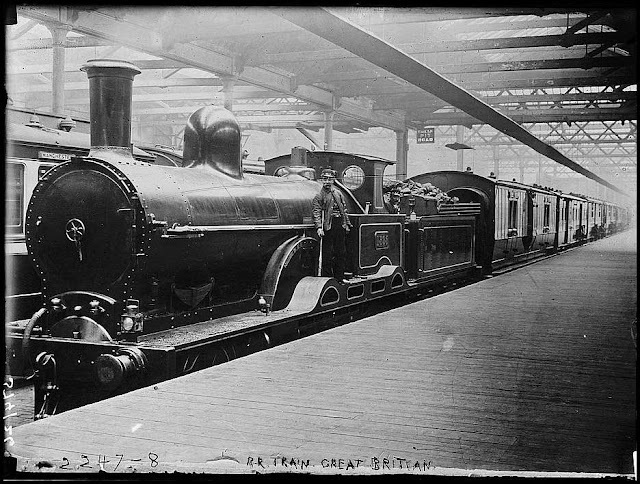 She was built at Crewe in 1886 and scrapped in 1904". Hopefully the train I will board on the 6th will be a little more modern than this, but if it gets me to my destination safely, I don't really care. Your destination is Sepia Saturday 77 where we will all meet on or around Saturday 4th June. Have a safe journey. I have a slightly odd archive photograph for you this week. It comes from the digital archives of the Powerhouse Museum, Sidney. 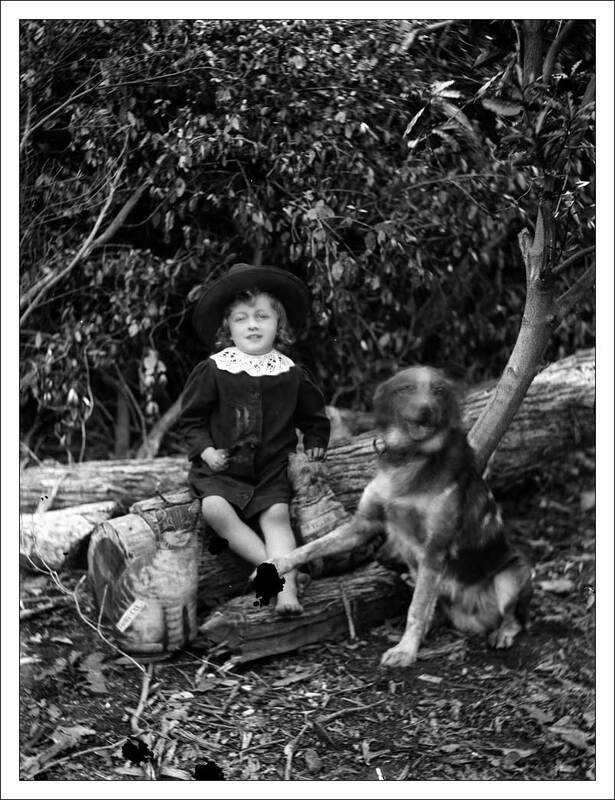 Australia and it has the appropriate title "Portrait view of child wearing a sun hat with a dog and toy cat". If you look carefully it would appear that there is a toy dog as well, so perhaps the title should be amended. It was probably taken by the Australian photographer Arthur Phillips around 1890, and it is the original glass negative that is in the Powerhouse Collection. Odd or not, there is plenty for the "themers" amongst us to get their teeth into (if you will pardon the expression). For the rest - post what you will - as long as it is old it is sure to be interesting. Sepia Saturday 76 will take place on or around Saturday 28th May. An odd little photograph this week. It clearly states that it is "The Orchestra, Town Hall Section, Southern General Hospital, Oxford". The Southern General Hospital was one of the many special military hospitals established during the First World War. Based in the Examinations School of Oxford University, it provided care for some 336 officers and 1,210 other ranks. The "orchestra" featured in the photograph looks a rather grand chamber, but whether it is in the Examination School or perhaps Oxford Town Hall, I am not sure. We have guests coming to visit us from Oxford this weekend, so I will see if they can identify the exact location. 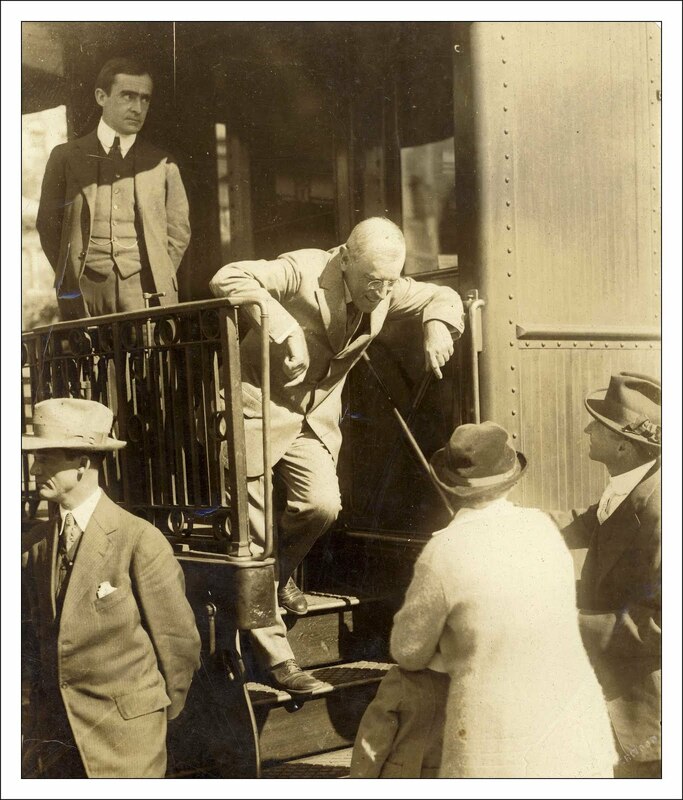 I doubt even they will be able to shed light on how this photograph found its way into Woodrow Wilson Presidential Library Archives. Whatever the reason, there are an abundance of possible prompts for the "themers" amongst us. Just help yourself to a theme and post your post on or around Saturday 21 May 2011. Holiday time is approaching and in a few weeks time I will be making my way down to Heathrow and climbing inside some sophisticated tin can that - hopefully - will ferry me to the other side of the pond. 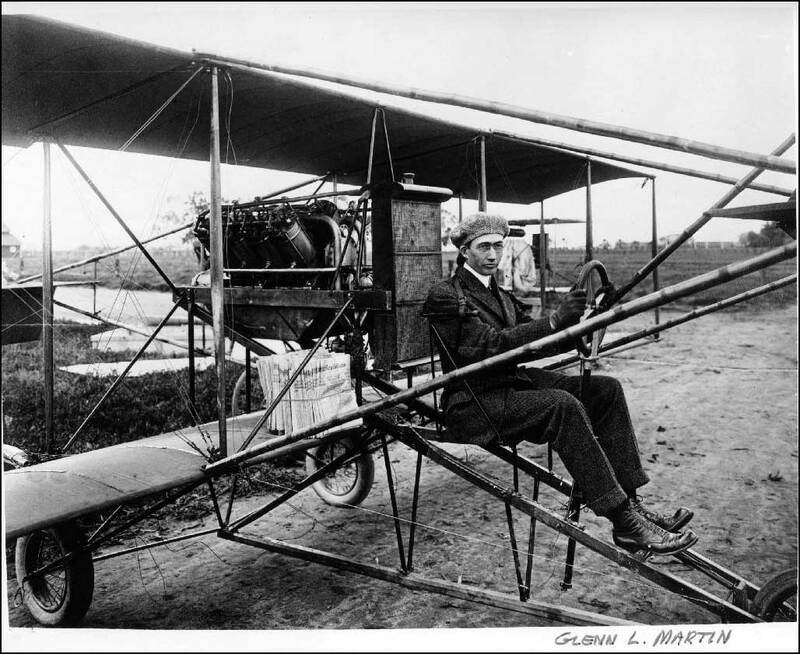 I trust that it will be slightly more sophisticated than the contraption captured in this photograph of a bi-plane. The pilot is Glenn Luther Martin who went on to establish the Glenn L Martin Aviation Company in 1912. The picture, which is undated, comes from the collection of the San Diego Air and Space Museum and forms part of their collection which is available on Flickr Commons. We don't leave until early June, so I still have time to put together a batch of calls covering the period I will be away : more details of that nearer the time. This particular picture provides plenty of scope for the "themers" this week - planes, newspapers and ridiculous hats all spring to mind. Whether you are a "themer" or just someone who wants to share an old photograph, Sepia Saturday 74 will be boarding at Gate 14 on or around Saturday 14th May 2011. Please have your passport and boarding card ready. We seem to have been celebrating marriage recently so how about this happy couple. No handsome prince of the royal blood, he : no fresh-faced beauty, her. 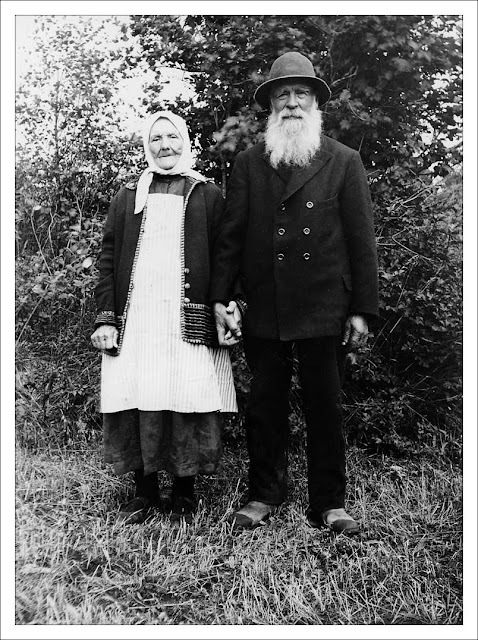 This is Mr and Mrs Samuelsson, of Stigåsa, Småland, Sweden. 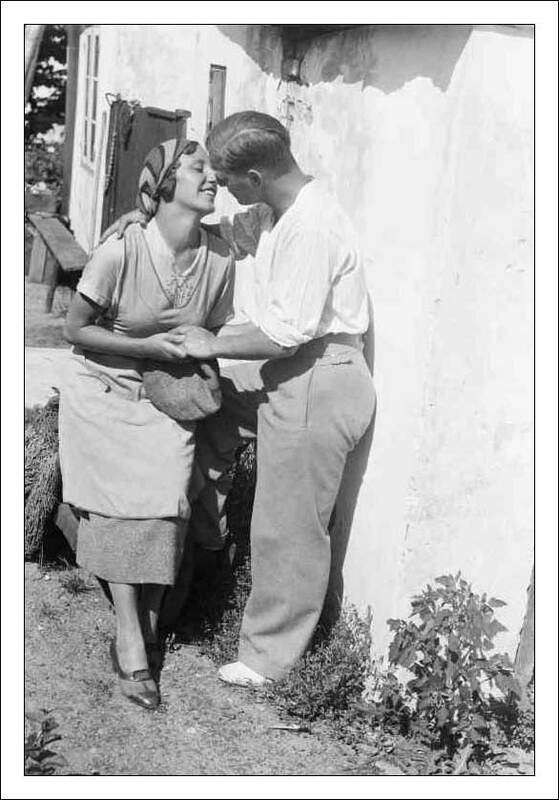 The photograph was taken in 1932 when he was 75 years old and she was - well, who knows. For the "themers" amongst us, themes abound : couples, old age, beards or even Mrs Samuelson's missing teeth. For the rest, post any old picture you want and join in with Sepia Saturday 73 which will take place on or around Saturday 7th May. Young or old come along and join in.